LibreOffice finally got an Ubuntu PPA so it's now a lot easier to install and stay up to date with the latest LibreOffice versions. While the LibreOffice website does offer .deb files for download, it's usually better to use a PPA for this since you'll always get the latest LibreOffice version automatically, like any other update. Further more, the LibreOffice packages in this official LibreOffice Ubuntu PPA are backported from Natty so they come with all the patches/optimizations applied to LibreOffice for Ubuntu. Important notice: to install LibreOffice you must remove OpenOffice so you cannot have both in the same time! 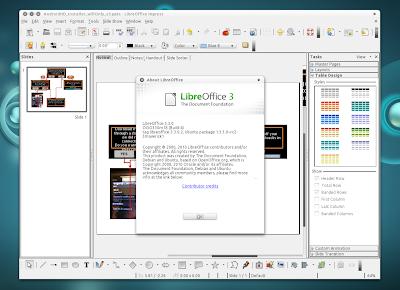 The LibreOffice PPA currently provides LibreOffice 3.3.1 for Ubuntu 10.04, 10.10 and 11.04. Please note that it takes a while until the latest LibreOffice versions are added to the LibreOffice PPA but they eventually are uploaded so please be patient - it takes a while to update the patches for Ubuntu and so on. You can replace "-en" with your language in the above command.